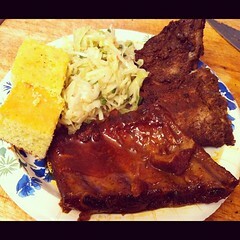 Ribs are all we do and we’re told they are the best around. The key to our ribs is time; six hours of cooking and 100 years of heritage from a family recipe. Our ribs fall off the bone every time because we take the time. We source only local, grass-fed, hormone-free pork. The utilization of these ribs is an extension of the head-to-tail ideology employed when the recipe was developed decades ago. We use 100% of all the products we source. 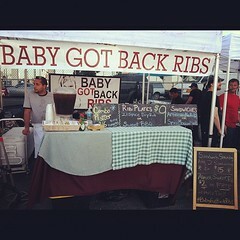 Baby Got Back Ribs burst onto the New York City food scene at The Smorgasburg in April 2012. 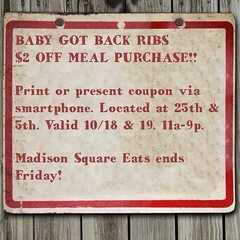 Since then, we have built a loyal and diverse customer base of rib-loving locals. Our success in Brooklyn has lead to more opportunities including several festivals, an invitation to serve at Madison Square Eats, and a Nomination for ‘Market Vendor of the Year’ at the 2012 Vendy Awards. Emmy Award winning producer turned Rib Master, Robert Liano, founded the company after completing a Culinary Arts Degree from The French Culinary Institute. After 20 successful years of producing TV and Film, he set out to achieve another long-time dream, to become a quality cook. Hey Denise! We do cater parties. Emails us at bgbribs@gmail.com and we’ll chat. Thanks!